Welcome to Los Gatos Bed & Breakfast! We are located between Keuka Lake and Seneca Lake near the village of Penn Yan, New York. There are many things to do in this region- Wine Trails, (and Beer Trails and Cheese Trails) water activities on the lake, antiquing, biking, and sight-seeing, and Los Gatos offers a comfortable starting out spot for all of them. We offer three large, comfortable rooms with queen sized beds, private baths, and comfortable seating as well as two individual log cabins with all the same features and amenities as the main house. 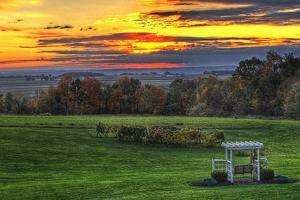 We feature beautiful country views, yet are just minutes from Seneca and Keuka Lakes. Enjoy a full country breakfast, then relax and watch the valley below. In the evening, we can recommend a restaurant that suits your mood- from country casual to elegant, romantic dining. On clear nights we often give star tours with a large telescope on our back lawn. Be sure to visit our on-line Gift Shop! Our homemade jams and jellies are featured at local wineries and restaurants (and our breakfast table, of course!) Please explore our web site to find more information and photos about Los Gatos Bed & Breakfast, and some of the many attractions in New York's Finger Lakes region. There is an Availability Tool on the Rooms page- check room availability and book on-line! If you have any questions please feel welcome to email or call - we are open year round. Tour the Finger Lakes from a hot air balloon!